Updated info on iThoughtsX from toketaware.com and how you CAN use cloud syncing and you CAN share a license in your house. Awful Apple Genius Bar experience was so bad I wrote to Tim Cook…and got help. Terry Austin, aka twitter.com/ielectrons reviews Pocket Casts from shiftjelly.com. I review the RAVPower Dynamo On-The-Go Power Bank, a 14,000 mAH charger. In Chit Chat Across the Pond Bart takes us through Taming the Terminal Part 9 of n (Controlling Processes). Hi this is Allison Sheridan of the NosillaCast Mac Podcast, hosted at Podfeet.com, a technology geek podcast with an EVER so slight Macintosh bias. Today is Sunday October 6, 2013 and this is show number 439. I have a REALLY exciting announcement (at least exciting for me), I’m going to be on Tech News Today! This coming Tuesday at 10am Pacific Time if you go to http://twit.tv you can watch it live, or you can get it later at twit.tv/tnt. I’m really stoked about this – Tom Merritt asked me to be on when I interviewed him for NEXT weeks’ Chit Chat Across the Pond. Well enough about self promotion, let’s get going. Last week I did a review of iThoughtsX from developer Craig Scott over at Toketaware.com. I sent him a link to the review and he came back with some interesting thoughts and corrections. This is why I LOVE working with the smaller developers – in this case just one guy. Can you imagine Apple or Microsoft or Adobe getting back to me like that? Craig agreed that the wifi transfer I talked about is clumsy but sometimes necessary. The most important thing he told me though was that you absolutely CAN sync maps via Dropbox and box.net from your Mac to your iOS device. He sent me a link to a text description and video showing how to set it up. Once I watched the video, I could see exactly how to do it, and it works great! He shows how to create the shared cloud folder, and more importantly how to get all of your existing maps into that shared folder. It took, oh, maybe 1 minute for me to get it done. I’m soooo excited by how well this works! On Saturday I was in a class and I couldn’t help but show off how great iThoughtsX works, AND show off that the syncing works perfectly to my iPad now. He also asked me to clarify my concern with “Named Licenses”. Remember I went off on how annoying I find them, that you can’t share the license with another person in your house, and that I much prefer the Mac App Store licensing? Turns out that what he meant in his license description is that it’s just like the Mac App Store! This again makes the product literally twice as valuable to me if I can share it with Steve. Now it’s down to the $30/person price I wanted it to be. He’s noodling changing the wording so others don’t get confused as I did. I am pretty adamant about obeying licenses, even if the software doesn’t have stupid DRM on it to make me obey. In fact, I’m MORE likely to obey if the software developer doesn’t cripple their software with DRM. Knowing that iThoughtsX is ok for Steve to use to makes me super happy. Craig also got back to me on my complaint that the iPad and iPhone are separate apps rather than being universal. He explained that he developed the iPhone app 2 years before the iPad version – so when the iPad arrived he created a new app rather than make the existing one universal (quicker that way.) Now he’s stuck in that situation. He went on to explain that Apple doesn’t support ‘migration’ of users from one app to another – they’d need to pay again. Wow, never thought of that situation! After understanding that, I suggested maybe when he does the next huge rev, he could combine then in a new app. He wrote back again and told me that he’s actually working on a huge rev, and making it a universal app at the same time. That leaves him with the thorny issue of how to release it – a new app or an update to one of the others, with all the same migration issues. Glad I don’t have to make that decision! He sent over a link to some preview screenshots for his iOS7 version – it’s looks really nice! After hearing Craig describe all of this AND his super responsive reaction to my gentle suggestions AND my rants, I have to give iThoughtsX my full recommendation. I used it today to storyboard out an iOS app I want to build and it worked so great on the Mac, can’t imagine doing without it! Check it out at toketaware.com. Steve and I had a really interesting experience with Apple tech support this week, and I use the word interesting in the context of the ancient Chinese curse, “May you live in interesting times”. As you know, Kevin, aka @Big_in_VA kidnapped my childhood toy Mipples with a ransom demand that I buy Steve a 27″ iMac. 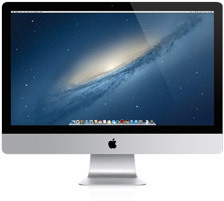 To get Mipples home, I complied getting him a late 2011 27″ iMac (in 2012) with all the bells and whistles. Steve loves his 27″ iMac. Last week though he pulled a memory card and got the often viewed “incorrectly ejected disk” warning. No big deal, but the machine froze. He held down the power button on the back of the computer and powered it down. So far so good, but pushing the power button again did not result in the machine powering up. It was dead. A lot of people mock me for buying AppleCare, but for $115 I had a hardware repair warranty on a $2800 computer. Seemed like a good tradeoff to me, especially last week. Steve carried the iMac into the Apple Store for our 4:30 Genius Bar appointment, arriving bout 10 minutes early just because that’s how we roll. We saw a huge crowd milling around the genius bar looking disgruntled and soon figured out why, we weren’t called until more than 40 minutes past our appointment time. At this point I’m just a little bit annoyed, but I happily tell the guy how brilliant I am for getting AppleCare. He tries the button a couple of times and agrees with our diagnosis that the iMac is dead. He told us that it would probably be a simple power supply replacement but that there was a test they could do to be sure. They have to pull the glass anyway to get to the power supply and when they open it up, there’s some buttons they can push inside to try and power it up. If it does power it up, then that means it’s the button itself that’s the problem instead of the power supply. That SOUNDS like it would be a better problem to have, but it’s actually worse, because they can’t replace the button, they have to replace the entire rear housing. He said he’d order both parts and the repair would be done in house because they understandably don’t ship the desktops themselves. Ok, great. How long is that going to take. The guy says that the parts should be here in about 1-2 days (great!) but that once they get here we get into the repair queue and it’s running about 5-7 days. ARE YOU KIDDING ME??? Potentially NINE DAYS to replace what’s probably a Power Supply? Yeah, I wasn’t happy at all by this time. But it gets worse. He shows me the work authorization and asks me to sign…and it says $260 at the bottom. He assures me that it won’t cost me $260 and says “sign here”. I was taught by my father not to sign anything I disagree with. There’s no way I’m signing this. He tells me that he put in the notes that it’s under warranty but I still didn’t think I should sign for it. I suggested that I would like to see a manager. He toodles off and is gone so long I have to ask other people to go find him. When Jeremy comes over, he promises me that it’s really zero. I suggested that he print out the work authorization, write $0 next to the fee and then sign HIS name to it, and then I would sign. Get this, he tells me they can’t print it. I lost it at this point. You can SO print! So Jeremy tells the guy to print it, Jeremy crosses out the $260, puts in $0 and we’re good to go. I should mention that several times throughout this the genius keeps suggesting that we really should just go to an authorized Apple repair facility. When I got back home, I did what anyone would do, I hollered on Twitter about the situation. Pramit Nairi replied that I should write to Tim Cook. Yeah, right. No, write to Tim Cook. Gee, really? YES! Write to Tim Cook! Ok fine. I penned a very unemotional letter to Tim. I started with the sentence, “I hope you can forward this to someone who could help me” so that it was obvious I wasn’t expecting his personal hands to do anything. Then I put a 3 line executive summary with simply 41 minutes for a Genius Bar appointment, 9 days to fix a power supply and being asked to sign for $260 when it was under warranty. I followed that with the detailed explanation of the situation. I shot it off to Tim. Two days later I got a call from the manager of my Apple Store telling me that the iMac was repaired and would it be convenient for me to come in this afternoon? Why yes, Hannah, it would. She told me to ask for her or Eric to make sure we were taken care of personally when we got there. We met Hannah briefly but spent a lot more time with Eric, the other service manager. He explained a few things to us that were pretty interesting. The problem did end up being the button, which meant that the entire computer had to be disassembled since absolutely everything is connected to the rear housing, and then completely reassembled into the new rear housing, taking him three full hours. He also explained why their system said $260 for that housing. Evidently it doesn’t fail very often, it’s almost always abuse in some way that breaks that giant back cover, so they simply don’t run into it as a warranty repair. I had to think of our friends over at iFixit and what kind of repairability this device has to fix that one button! I must mention this to Melissa Jenna! In the end we got our machine back in 3 days and paid nothing but I wasn’t actually asking to be pushed to the head of the line, I was hoping to draw attention to a broader problem to be solved. Hanna told me on the phone that the first service manager, Jeremy should NOT have signed that receipt for me, which was the only thing that got me out of the store that day. I have a feeling the letter may have done some good in the background but that particular part was a disappointment. In the end Steve has his baby back, but I think I’ll check into those certified Apple repair centers next time. Terry Austin – from IntelligentElectrons – aka @ielectrons reviews Pocket Casts, the first podcatcher optimized for iOS 7. Like many of you, I’m having a blast with iOS 7 and a new phone. I decided to explore a new podcatcher to match my shiny gold 64gig phone. 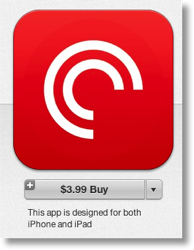 I’ve used other podcatchers previously including InstaCast, DownCast and iCatcher. We’ll be looking at PockCasts version 4 from those crazy australians over at Shift Jelly. and it does sync across all of your devices. ShiftJelly folks have an ADORABLE sense of humor. I forgot to enter my password when setting up sync… got a message “Ummmmmm We could as the NSA for your password, or you could enter it?” (OK). Then i mis-typed it… new message “CURSE YOU TINY KEYBOARD. That username and password combination seems wrong. Feel like trying again? (OK). In prepping for this review I installed the iPad version, enabled SYNC (entered my passwords so they didn’t have to contact the NSA) and watched all of my subscribed podcasts roll onto the iPad with each at precisely the spot I had paused on my iPhone. Interface optimized for each device… the iPad version differs in several ways from iPhone. I’ll focus mostly on iPhone version here… (Allison gave me a few generous minutes of her time). The UI is really optimized for iOS 7 with a tiled main screen of album art and some very intuitive gestures used to control the experience. The controls adapts to album art colors really taking advantage of that gorgeous iOS 7 experience. The layout is well thought out with functionality nicely matching both the iPhone and iPad. For instance, on iPad, show Notes visible in slide-out panel. On iPhone, when playing full-screen, swipe L/R the album art shrinks to top left corner and show notes fill the screen. Swipe R/L and album art re-fills screen. You can Airplay of both audio & video podcasts. Full control center support during playback, play/pause, ffw, rewind. You can Airplay of both audio & video podcasts. Full control center support during playback, play/pause, ffw, rewind. Auto-Download new episodes: set this individually for each podcast to customize as you see fit. Auto-Download new episodes. Set this individually for each podcast to customize as you see fit. Mark episodes as played with a simple swipe. CUSTOM – e.g. a list of video episodes that haven’t yet been downloaded. Customize the appearance of your filters (playlists) with color coding & custom icons. While in settings the currently playing episode lives in a bar across the bottom of the screen with a play/pause button. Tap that bar to return to full-screen controls. Settings for EACH podcast (tap the album art then the gear) this is where you can individually select auto-download. Lets you set a unique start point, like, oh say 14 seconds into the podcast. Yep, you can skip that repetitive intro that you’ve heard 100 times already! I don’t know about you, but I love battery chargers. I wish they didn’t have to exist at all, but I love finding new ones that take on the challenge in a new way. I have been carrying around the i.Sound Power Max charger for a few years now, ever since Rod Simmons from the SMR Podcast did a review on it. It’s a pretty giant brick with five USB ports on it, and holds a charge of 16,000 mAh. It’s a battery so it’s really heavy too, weighing in at 14.6 oz (414 grams). It’s got so much charge that I often take it on weekend trips and never even plug it into the wall to recharge it, just plug my devices into it and never run out over a weekend. Technically the i.Sound can charge an iPad, but since the max current it supports is 2.5amps, the iPad takes 2 leaving not a full 1 left for an iPhone or other device. It took me a long time to figure that out – sometimes it would charge my iPad and other times my devices would keep dinging with that start charging stop charging noise. Having 5 USB ports is really a waste, since you can’t charge even 3 iPhones at the same time. This week I got my hands on the RAVPower Dynamo On-The-Go Power Bank. So you’ll remember the company name, I’ll call it the RAVPower for short. This device is a bit lower in charge capacity at 14,000 mAh’s but that’s still more than enough to charge an iPad from completely dead at 11,600 mAH and still leaves more than enough to charge an iPhone 5 too. The unique feature of the RAVPower is that it has only 2 ports, but one is 1amp, the other is 2amps. By dedicating the ports in this way, you can charge both an iPad and an iPhone at the same time. I didn’t just believe the brochure, I tested it and sure enough I was able to charge both. The ports are labeled too, so you don’t have to guess which one is which. What’s the next most important thing in a battery charge pack? That it has cool blue lights of course! Well no, that’s not exactly right. The important thing is that you can easily tell how much charge is left in the battery pack. RAVPower just chose to do it on the Power Bank with cool blue lights. There’s a line on the top of the device next to the power button that lights up blue – one light for every 25% of power. It was intuitive what the device was telling me without any confusion. The RAVPower will stop charging your device when it senses your device is topped off which is pretty cool. It also shuts itself off when it senses that no devices need its power. The RAVPower is about 30% smaller AND 30% lighter than the i.Sound. According to the instruction manual the RAVPower should come with a charging cable that’s USB on one end, coiled to be stretchy for long length without a big cable mess, and on the other end it has a female tip port. Into that tip port you plug one of the included tips – there’s supposed to be one for micro, mini, Nokia and Samsung and it says in the brochure quite specifically that it does not include a 30 pin Apple dock connector tip. I say “supposedly” because I actually got two Apple 30pin dock connector tips, two of the stretchy cables, the micro and mini tips, along with just the Nokia tip. I don’t know whether the brochures just haven’t caught up with what they really sell or whether mine was some awesome mistake, but it worked out great for me. Oddly the RAVPower doesn’t actually come with it’s own power supply but instead simply has a micro USB connector on it so you can plug in one of the other 238 wall you probably have lying around the house. I think that anyone who needs one of these devices probably has enough power supplies or wall adapters available to them. The RAVPower comes with a lovely flannel bag which is nice so you can carry the battery pack and all the little cables and tips. I’m delighted with the RAVPower Dynamo On-The-Go Power Bank – it’s small, it’s light, it’s got charge to spare, it charges 2 amp devices like iPads and other tablets along with phones with ease, and at 14,000mAH it will run you $43 on Amazon, nearly half of what the i.Sound costs. If that’s too rich for your blood and your amperage needs are more modest, they also sell an 8400mAH version that still has that lovely 2amp port for only $35. I love this device! One of the ways you know you’re a grown up is when you get really excited about home owner stuff. This week Steve and I finally replaced the 20 year old windows in our house. We’re super happy with them, but I wasn’t thrilled with the screens when we first got them. They were fiddly, and I already HAD screens that were fiddly so I didn’t really want to pay all that money for new fiddly screens, you know? Well Dorothy, aka @MacLurker was the one who recommended the particular company we went through so I asked her how her screens worked. I asked her if she could take a picture of the mechanism so I could see if it was the same as mine with these two springs on one side. Can you guess what she did instead? Yup I see you with your hand up, she made a Clarify document for me! It was a great way to drop a bunch of pictures into one document and to write some explanatory text to go with each picture. She also used some nice yellow arrows to point to the bracing springs and the tabs and a lovely rounded corner text box to explain what they were. Because she was able to make things so clear, I could tell that the manufacturer had redesigned the screens, eliminating that handy pull tab on my model while keeping the springs. I love all the creative ways people are finding to have Clarify help them teach, explain and even help themselves remember how to do things. If you’d like all this joy in your life, head on over to clarify-it.com and download a free trial of Clarify, for Windows or Mac, and when you do eventually buy Clarify you know what to tell them! Bart, do you know when open was introduced? I created a similar cross platform (*n*x, and MAC) perlish workaround years ago that probably needs updating.